Again as every Christmas, we should pay attention to the various christmas market spread throughout Italy. Let’s start with Trieste, in north east of Italy, exactly in Friuli-Venezia Giulia region. The town is an architectural mixing up of different architectures: here Muslims, Slavic and German heritage mix together into an exciting sightseeing. La Fiera di San Nicolo is one of the most important feast held in the region. In the first week of December, the market will sell toys, candy, and Christmas products. 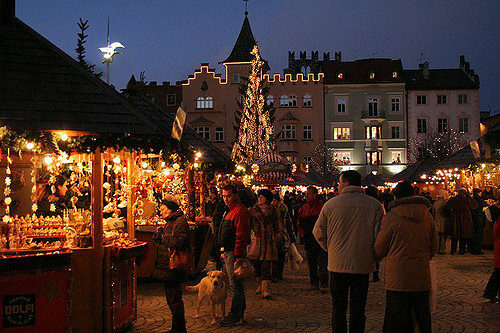 If you are in friuli do not forget to go to Pordenone, which holds a market from the first of December up to the 24th. Milan offers a Wonderland Village in the historic centre from early December on through January 6: a market, ice-skating rink, and entertainment. “Oh Bej, Oh Bej” is a big market with several hundred stalls held near Castello Sforzesco on December 7. Bologna hold a Mercatino di Natale starting late November on and Torino during December in the Borgo Dora area. Also Genoa holds a week-long Christmas and winter fair in December: exhibitions of arts and handicraft products here are for sale. Going Central we will find the famous Rome‘s Piazza Navona with a big Christmas Market. Father Christmas will be there for picture taking opportunities! A life-size nativity scene set up in the piazza later in the month. In Florence everything starts at the end of November. Go and visit the house of Father Christmas, after a Christmas market round in Piazza Santa Croce, which is a popular German-style Christmas market with many booths from the end of November through mid-December. Lucca holds a Christmas market in Piazza San Michele, usually through December 26. Siena, in Tuscany, holds several Christmas markets during December. Perugia, in Umbria, has its own big Christmas market for three weeks in December in Rocca Paolina. This entry was posted on Thursday, November 29th, 2012 at 4:58 pm	and is filed under Events in Italy. You can follow any responses to this entry through the RSS 2.0 feed. You can leave a response, or trackback from your own site.